A delicate Battenburg free standing lace machine embroidery design. 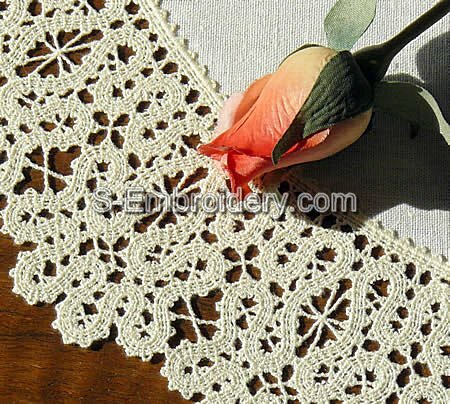 Stitch it out eight times and in combination with suitable fabric it will produce a fine doily like the one featured here. The design comes with instructions for creating the doily. 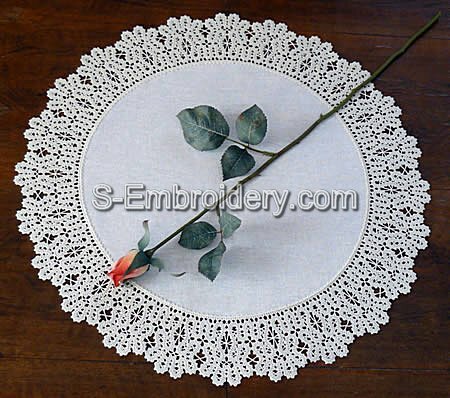 The diameter of the ready doily would be approximately 50 cm / 20 inches. I have made a lovely table cloth with design 10454.I entered it in the Lace section at the Launceston Cottage Show, Tasmania. It won first prize plus best in show. i just love the sewing out, and insertions of fabric,please do more of this with fabric. Regards Judy.